Howard Zebker, Professor of Geophysics and Electrical Engineering at Stanford University, said "If there is sufficient energy pumped into Titan's atmosphere and surface from the sun, then it is possible that this would this would spawn evolution of life forms that take advantage of the energy source. It would be very different life than on Earth, as it is minus 292 degrees Fahrenheit most of the time. 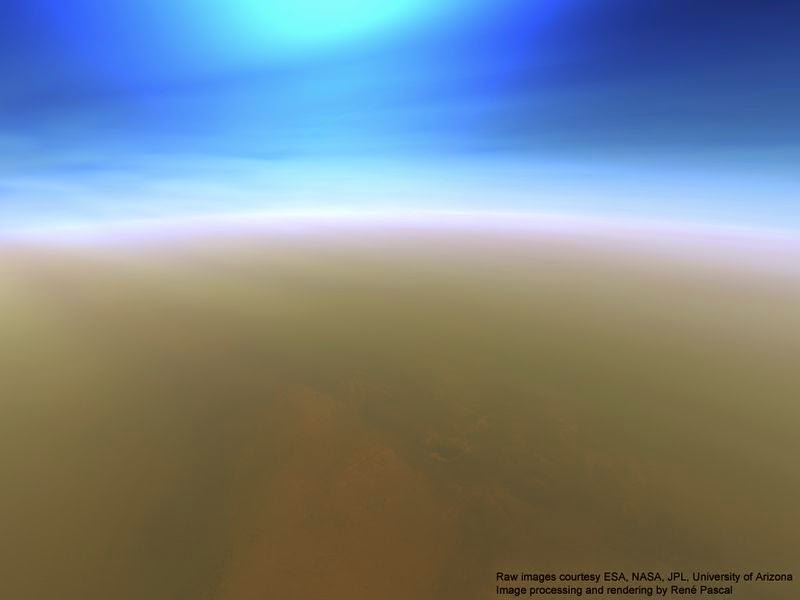 Still, Titan remains one of the best places for life to evolve in the solar system." Mysterious structures dotted on Titan expose the moon's seasonal variations. Bright spots in a huge lake on Titan propose that Saturn's biggest moon supports procedures comparable to Earth's water cycle, says Zebker. At first glimpse, Titan has little in common with Planet Earth. The biggest moon of Saturn, temperatures on Titan's surface incline approximately 300 F below zero, its seas gurgle with liquid methane, and its sky is a dark shade of creamsicle. And yet, new study of mysterious features spotted on the moon specifies that it practices one of the similar global courses that are important here on Earth. In a research distributed in the latest issue of NatureGeoscience, researchers working with the Cassini satellite, counting Zebker, present proof that Titan has seasonal cycles analogous to Earth's, and that the moon's surface situations varies as the Titan year reveals. The Nasa’s Cassini satellite has been circling Saturn and its moons since 2004. Zebker, is one of the main researchers operating the spacecraft's radar tools. Radar is critical for studying Titan in specific because the moon's atmosphere is naturally too cloudy and thick for optical tools to see through without difficulty. Through five fly-bys of Titan's Ligeia Mare, a liquid methane sea greater than Lake Superior, the researchers observed bright features that appeared and altered shape on the sea's surface. After ruling out a mechanical glitch or an exotic object of radar scattering, the group concentrated on three sources most likely for the occurrences. One such clarification could include low-density solids that typically sink below the surface, much like sludge in a river delta, but then increase and bunch together. Contrasting ice on Earth, frozen methane is thicker than its liquid stage, so it sinks instead of floats. Regular temperature variations could account for the presence and disappearance of these solids, as they might be unconfined from the bottom and upsurge to the surface in warmer temperatures. A second description includes bubbles. As summer temperatures warm the sea, bubbles surrounded by the dipped frozen material could be released and drift to the surface. Lastly, the bright features could be cresting waves, thrashed up by summer breezes. Two-and-a-half billion years ago, the Earth's atmosphere was filled in hydrocarbons, related to Saturn's moon, Titan. Before Earth's atmosphere abandoned methane and initiated gathering oxygen, though, our planet seems to have cycled back and forth every few million years among the two states years a hydrocarbon haze and perfect skies. A sunlight-blocking mist most surely affected the evolution of microbes that rely on light to photosynthesize and contributed to the interval before the ending oxygenation of the atmosphere.